Obituary for Eugene C. Holmquist | Bowerman Funeral Home, Inc.
Eugene C. Holmquist, age 90, of Trenary, died Monday evening, November 26, 2018 at the D.J. Jacobetti Home for Veterans in Marquette, Michigan. He was born on June 15, 1928 in Trenary to Carl and Kathleen (Kiser) Holmquist. Gene was raised on the family farm in Trenary and graduated from Trenary High School in 1946. He then attended Michigan State Agricultural College. Gene joined the U.S. Army on December 5, 1950 and was stationed in Germany. He was honorably discharged on November 14, 1952 and returned home to the family farm. The remaining story of Gene’s life can be broken up into the subjects of work, family, and community. WORK – Gene purchased the feed mill in 1953 and owned and operated Holmquist Feed Mill. He expanded the grinding of corn, oats and barley feed by adding accessory items, fencing, and feeding and supplies for rabbits, dogs, and birds. There was constant expansion taking place. Gene also purchased a shingle company from Spaulding and relocated in to Trenary where it became known as Trenary Wood Products. He was a good businessman with a great memory of his customer’s names and what their needs were. In 1998 his daughter and son-in-law purchased the mill and Gene continued to work every day. He also continued crop farming during his daily devotion to the mill operations. Four years ago, he was in a car accident that caused debilitating injuries that needed full time care and he became a resident of Jacobetti Home for Veterans. FAMILY – On December 30, 1961, “Trenary’s most eligible bachelor” married the love of his life, Ruth Niemi Kaukola. Ruth had been widowed with six children and Gene acquired an instant family. He and Ruth raised their family on the Niemi farm and continued to farm crops and animals. They celebrated over fifty-six years of marriage and leave generations of loving family members. Together, their hard work gave the family a safe and loving home. COMMUNITY – Gene provided jobs and direction for many of Trenary’s youth and people who needed a second chance or help. He and his employees were instrumental in the construction of the Community Building in Trenary. 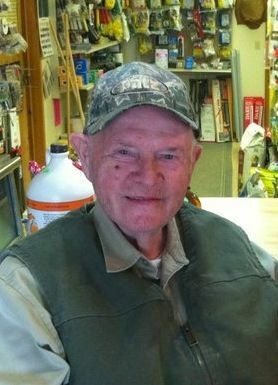 Gene was a member of the volunteer Fire Department and was a dedicated and faithful member of the Trenary Lions Club. He was honored for his decades of perfect attendance and dedication to the Lions Club, 4th of July activities and the community. Gene will also be remembered for being a jokester and always having a story to share. He is survived by his wife Ruth; five children – Beverly Plimpton of Cornell, MI, Gretchen (Darryl) Fossen of Hermansville, MI, Robert (Laurie) Kaukola of Winthrop, MN, Debbie (Les) Francisco of Fort Worth, TX, and Sharon (Steve) Boyer of Trenary; grandchildren – Kevin (Danielle) LeBoeuf, Robert (Heatherlyn) Plimpton, Cory (Janelle) Fossen, Rebecca (Dave) Subert, Krystie (Ryan) Dovenmuehler, Jake (Brooke) Kaukola, Jamie (Tripp) Littleton, Stacey (Colin) Pomeroy, Sara (Matt) Rohde, Shannon (Andy) Luehmann, and Stephanie (Mike) Lovell; twenty-three great grandchildren; brothers – Keith Holmquist of Menominee, MI and Bruce Holmquist of Kingsford, MI; sister-in-law Ethel Holmquist of Gladstone; and numerous nieces and nephews. Gene was preceded in death by his parents, son Allen Kaukola, son-in-law Robert Plimpton, brother Gordon Holmquist, and sisters Thelma Carlson and Neola Juntunen. Visitation will be on Saturday, December 1, 2018 at the Bowerman Funeral Home in Munising from 3:00 until 6:00 p.m. Military honors will be conducted by the American Legion and Vietnam Veteran Honor Guard at 6:00 p.m. There will be an opportunity for family and friends to shares stories and memories following the military honors.